We've made a lot of improvements around team management (for ThoughtStreams for Teams) including adding role management, the ability to remove people from a team, invite revocation and resending of invites. created Sept. 24, 2014, 9:31 p.m.
ThoughtStreams now supports gravatars. You can still upload a new avatar to the site but, by default, a gravatar will be used if available for your email address. An avatar uploaded to the site will always be used over the gravatar so if you already had an avatar, nothing will have changed. created Aug. 8, 2014, 3:46 p.m.
To improve the experience for readers, we now scale all uploaded images to a maximum of 640×640 on the server (rather than just in the browser). Note that we still keep the full-resolution image. This scaling is just to improve load times when viewing images on cards. created June 27, 2014, 5:08 p.m.
Firstly, when you're on a card detail page (just click the timestamp on the lower right of any card) the earlier / later links now navigate to the earlier / later card. Secondly, we've introduced keyboard support: left-arrow and right-arrow navigate between the cards in a stream. up-arrow will take you back to the overall stream. Thirdly, you can toggle between the normal card detail display and a distraction free larger display for presentations with the p key. We have more planned for presentation mode and a lot more planned for keyboard support, so stay tuned! created June 16, 2014, 5:42 p.m. The changelog is now under the docs user rather than jtauber. All old links should redirect. created June 13, 2014, 7:22 a.m.
We've made a number of fixes to the display of reposts and especially reposts of reposts (where the original author of the card and the owner of the stream reposted from were previously mixed up). created June 13, 2014, 6:58 a.m. It's now possible to edit, unpublish, and delete your cards right from a combined stream. created June 13, 2014, 6:55 a.m.
We've redesigned the look of streams that interleave multiple authors. This includes combined streams as well as the firehose and general thoughts tabs on the latest page. Previously cards on these streams looked very different from what they did elsewhere because of the avatar and the use of the blue bar to indicate source (conflated with reposting). Now cards have a consistent look. With the new look, the stream title, author and avatar are now shown alongside the card. If multiple cards in a row come from the same stream, we don't repeat the information. On Safari (including iOS) the stream title, author and avatar are sticky so will follow as you scroll. This will work on other browsers as they roll out support for position: sticky. created June 4, 2014, 8:30 p.m. When you repost to a stream, the Updated Streams tab on the latest page more clearly indicates that it was a repost. This particularly helps with reposting someone else's content where the authorship was not previously clear glancing at the updated stream. created June 4, 2014, 7:29 p.m. There's now a new tab New Streams on the latest page which shows streams in the (reverse) order they were created. created May 28, 2014, 9:42 a.m.
We've renamed the Latest Streams tab to Updated Streams to reduce confusion. The tab has always shown the most recently updated streams, not the most recently created streams and this name change (we hope) makes that fact clearer. created May 28, 2014, 8:10 a.m. The firehose now includes general thoughts. created May 23, 2014, 11:06 p.m.
We've now added endless pagination to the latest page. Each of the Latest Streams, General Thoughts and Firehose tabs will now incrementally load older information as you scroll down. We will likely roll it out to other streams as the amount of content increases (we still load the entire stream at once outside of the latest page). created May 14, 2014, 6:25 p.m. The buttons also now start off disabled until you start typing content. created May 7, 2014, 1:49 p.m.
We've re-done media uploading and management. Paid users have always been able to upload images to include on their cards but we've improved how this looks and works. created April 30, 2014, 4:44 p.m.
A field for Twitter username has been added to profiles. Just go to Settings > Profile to add yours. If you have a Twitter username set, then when your streams or cards are tweeted, the tweet will include an @-mention of your Twitter username. created April 24, 2014, 9:54 p.m.
You can now add thoughts directly from a combined stream. Previously, if you were looking at a combined stream and wanted to add your own thoughts, you'd have to navigate to your own stream to add the thought or, if your stream didn't exist, go create it then add your thought. Now you can add a thought right from the combined stream. If you don't have a matching stream, one will be created for you automatically. created April 17, 2014, 10:49 p.m.
On our new latest streams / latest general thoughts / firehose page, your tab selection is now maintained across browser refreshes (which also means you can bookmark a particular tab selection). created April 17, 2014, 10:46 p.m.
ThoughtStreams now has a completely new UI for reposting. Reposting is a great way to take a thought from elsewhere (maybe another stream of yours or a stream from someone else) and either put it in one of your existing streams or use it to kick off some new stream. Previously, when you clicked on this, it took you to a different page where you could select from a list of all your streams or type in the name of a new stream. You'll then be redirected, as before, to the destination stream. Note that reposted cards are initially unpublished so, to make them visible to others, you'll still need to publish them. created April 5, 2014, 3 a.m.
We have a nice new homepage (when unauthenticated, as authenticated users will now be taken straight to the "latest streams" page). The nav bar colour has been updated to match it. created April 2, 2014, 7:26 p.m.
We've added a new page where you can see at a glance the latest streams, latest general thoughts, combined streams, newest users and even a firehose of all the latest thoughts. If you're logged in, you can get to it by clicking on the ThoughtStreams logo in the top-left. If you're not logged in, there's a link on the home page. This new page replaces the latest streams on the home page but includes more streams and other information. We hope this will keep you better up-to-date with what's happening on ThoughtStreams and help you find more great content. created April 2, 2014, 3:01 a.m. Individual cards now have their own page. Whereas previously you could only refer to a specific card with a fragment identifier (which would highlight the card in the context of the entire stream), you can now also link directly to a card shown in isolation. One benefit of this new feature is it makes sharing individual thoughts on Twitter, Facebook, etc work a little better. We also have some new features in the works that will rely on cards having their own page. The fragment identifiers will still work and updates on the home page still link to cards in this way to give you the context. But now, if you hover over a card and click on the date-time at the bottom right, it will take you to the page just for that card. created March 26, 2014, 7:37 p.m. Simple stats (thought counts and last update) are now also included on stream detail pages (including combined streams). created March 12, 2014, 3:40 a.m. User pages now have some simple stats around stream and card counts and when the last (public) post by the user was. created March 1, 2014, 8:59 p.m. Previously you could only delete streams from the stream list and, even then, only if they were unpublished first. Now you can delete streams that are published and can do so right from the stream page itself. Deletion will still prompt you before going ahead, though. There's no undo if you confirm. created Feb. 28, 2014, 6:18 p.m. Both ascending and descending sorting are now available on streams. Stream authors can set the default on a per-stream basis. See "Default the stream to sort in ascending/descending order." on the panel on the left of the stream's page. Readers can toggle between sort direction of any (named) stream with the arrows at the top of each stream. created Feb. 26, 2014, 4:37 p.m.
Full Text Search is now available from every page. Stream content as well as user info is indexed. created Feb. 4, 2014, 6:46 p.m.
We've tweaked the post-Markdown sanitization a little to allow for <hr>, <sup> and <sub>. This seems to allow footnotes in Markdown to work but note they are still problematic because each card is treated as a separate Markdown document so the same IDs are reused between cards in the same stream. created Jan. 28, 2014, 6:21 p.m.
With the incorporation of the general stream into the user page, we've completely redesigned the display of streams from a grid to a list on the right-hand side. This redesign has also been carried over to child streams on a stream page. created Jan. 25, 2014, 4:53 p.m.
We've replaced the Inbox with a general, un-named stream that lives on your user page (which used to just show Your Streams). This "general stream" is like your Inbox with the big difference that you can publish cards in it. We noticed a lot of people were having to create a named stream just for this (with names like "Random Thoughts"). Now you don't have to. If you have such a stream and you'd like the cards moved over to your general stream, just email thoughtstreams@eldarion.com and we can move them over for you. You can read more about some of the motivation and details of the general stream feature in the General Stream stream. created Jan. 25, 2014, 4:02 p.m.
Markdown documentation has been added and linked from "Markdown supported" under the add card and edit card text areas. created Jan. 23, 2014, 1:25 p.m.
Clicking on an updated stream on the home page now takes you directly to the latest card. created Jan. 23, 2014, 8:46 a.m.
As part of a huge clean up of the site's CSS, ThoughtStreams has an updated, flatter look. created Jan. 22, 2014, 10:21 p.m.
Media upload now shows a progress bar so you can tell if your drag-and-drop was successful and the upload is in progress. created Jan. 16, 2014, 1:54 p.m. Combined streams are now available in Markdown and as an Atom feed. created Oct. 25, 2013, 10:44 a.m.
You can also now create your own individual stream of the same name from someone else's stream by clicking on Create your own stream... on the left sidebar. created Sept. 2, 2013, 6:07 p.m.
You can now create your own individual stream right from a combined stream (if you don't already have one of the same name). created Sept. 2, 2013, 4:54 p.m. It's now much easier to navigate from an individual's stream to the combined stream (if one exists). All users participating in a combined stream and now listed in the side bar too. created Sept. 2, 2013, 4:51 p.m. Combined streams now have a proper title (taken from the streams that kicks it off) and it is possible to repost to a stream of your own from the combined stream. created Sept. 2, 2013, 4:48 p.m. In addition to the exist per-stream atom feed, there is a now an atom feed for each user which aggregates their streams as well as an overall atom feed which aggregates all streams on the site. created Sept. 2, 2013, 4:39 p.m. The regular email update now includes a list of new users who have joined the site since the last email update. created Sept. 2, 2013, 4:38 p.m.
You can now export your data as JSON from Export Data under Settings. created Sept. 2, 2013, 4:33 p.m.
As the first step in more collaborative thoughtstreaming, we've added combined streams. The URL /combined/<slug>/ will now show a stream that combines all (published) streams with that slug, regardless of user. This combined stream is currently not actionable (you can't repost from it, etc) but that will come soon as well as a more controlled form of collaborative thoughtstreaming where you'll be able to set up "group" streams. created Aug. 12, 2013, 10:20 a.m. This is still very much a work in progress but if you add ?style=clean to the end of a stream view you'll see the beginnings of a cleaner styling I'm playing around with for streams (read-only, though). created Aug. 12, 2013, 9:47 a.m. Fixed bug where Create new stream button was appearing on pages that weren't yours. It didn't do any damage but it shouldn't have been in those places. created July 26, 2013, 7:44 p.m.
We've updated a bunch of dependencies, so let us know if you notice anything strange / broken. created July 15, 2013, 5:32 a.m.
Reposting is no longer restricted to existing streams! When you repost a card you can now give the name of a new stream to create and repost the card to as an alternative to picking an existing stream. created April 27, 2013, 4:05 a.m. The Create new stream button is now on the top right of your user page rather than at the bottom of the side bar where it was harder to get to. created April 27, 2013, 3:40 a.m.
We've added experimental support for Twitter cards and the Open Graph protocol so streams that are tweeted or shared on Facebook will present better. created April 27, 2013, 3:23 a.m.
Homepage now displays the eight (rather that four) most recently updated streams. created Feb. 16, 2013, 1:16 a.m.
Markdown formatting and sanitization have been rewritten to allow much better embedding of HTML. Please let us know if you experience any problems with new or existing cards. created Feb. 16, 2013, 12:57 a.m. Publish / Unpublish Stream (on stream page) is now a button rather than just a link. created Feb. 9, 2013, 10:22 a.m.
Reposted from/to now links username to user page. created Feb. 9, 2013, 9:04 a.m. Streams on each user page are now sorted by last update timestamp. created Feb. 9, 2013, 8:41 a.m.
We've added tooltips to all card and stream actions and fixed display issues with long tooltips. 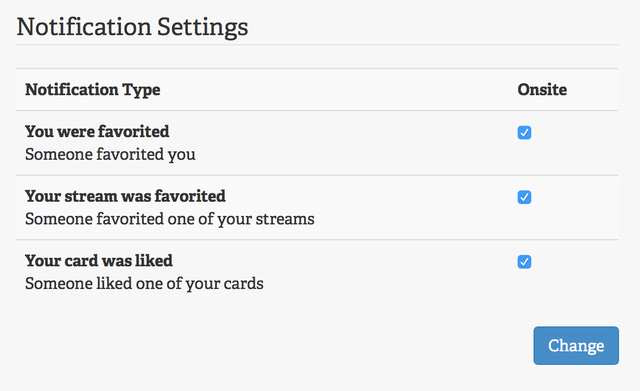 created Feb. 9, 2013, 8:40 a.m.
You can now repost other people's cards to your streams! We plan to refine this further with notifications and opt-out links, but this is a simple but significant change which will hopefully spawn all sorts of possibilities in terms of responding to the thoughts of others. created Feb. 8, 2013, 3:54 p.m. It is now possible to edit or delete a card in the published state without having to unpublish it first. created Feb. 8, 2013, 3:19 p.m.
Timestamps are now localized based on the timezone you specify under Settings. created Feb. 6, 2013, 7:21 p.m.
We've changed the position of the card controls and made the main content area for cards wider. We've also made overall tweaks to cards and streams to make the design more consistent between the two. created Feb. 4, 2013, 7:40 a.m.
Email updates now include popular streams (by views in last seven days) both across the site and those specifically authored by you. We've added profiles that include full name, an avatar, bio, location, website and Gittip username (all optional). If you include a Gittip username, a Gittip button will appear on your main page. created Jan. 17, 2013, 7:27 a.m.
Thoughtstreams now supports media hosting. On a stream (other than your inbox) you can drag images in then, with a single click, insert the required Markdown to inline the image. created Dec. 22, 2012, 4:27 a.m. There's now a twitter button on each stream. created Nov. 30, 2012, 12:28 a.m.
An API now exists for posting to your Inbox. created Nov. 5, 2012, 3:16 a.m.
Now, by default, streams that are children of other streams do not appear at the top-level. You can override this on a per-stream basis by clicking "show at top-level" on the stream's page. created Nov. 3, 2012, 9:49 p.m. Streams can now be children of other streams. This enables you to organize related streams. You can either create a child stream from the parent stream's page (the "Create new child stream" button) or you can put an existing stream under another stream by going to the stream you want to be the child, clicking on "Make child of another stream" and selecting the parent (or creating a new stream to be the parent). Note that streams can have as many parents as you like. At some point in the near future, it will be possible to elect, per-stream, whether a stream that has parents is still to be shown at the top-level. created Oct. 29, 2012, 1:49 a.m.
As well as a markdown dump, each stream is available as an atom feed. created Oct. 10, 2012, 8:42 a.m.
You can now create and publish a card with a single click. created Oct. 9, 2012, 5:54 a.m. When 'Create new stream' is clicked, the browser now scrolls to the form and focuses on the stream title field. created Oct. 9, 2012, 4:10 a.m.
Cards can now be edited while in the unpublished state. If a card is already published, it can be edited by first unpublishing it. Note: this is intended for minor corrections to formatting, spelling, grammar, etc. The spirit of ThoughtStreams is that if you actually make a mistake or change your mind, you just do a followup card and leave the history intact. created Sept. 15, 2012, 8:52 p.m.
created Sept. 7, 2012, 11:39 a.m.
We've opened up signup and implemented payments and subscription management. created Sept. 3, 2012, 8:19 a.m.
SSL has been added . Unfortunately, if a card links to a non-https URL (such as the image above), it will cause a mixed content warning. created Sept. 3, 2012, 8:18 a.m.
created Sept. 1, 2012, 11:42 a.m. It's now possible to repost a card from one of your streams to another. From your Inbox, this is a move; from any other stream, this is a copy. created Sept. 1, 2012, 11:41 a.m. The metadata shown on a card at the bottom right on hover is now clickable to give a fragment identifier to the card. The targeted card will be colored differently. created Aug. 30, 2012, 4:16 a.m.
created Aug. 30, 2012, 3:58 a.m.
created Aug. 29, 2012, 4:28 a.m. The homepage now shows the most recently updated streams. created Aug. 28, 2012, 4:12 a.m. 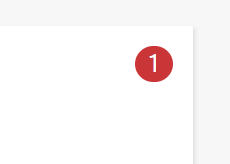 There is now an Inbox, linked from the nav in the top-right, where you can add cards you don't have a stream for yet. created Aug. 28, 2012, 2:58 a.m.
You can now pick any published card to be the lead card for the stream. The contents of the lead card will be shown for that stream on the user's page. Here's where I'll post updates on what's changed with Thought Streams site. created Aug. 28, 2012, 2:52 a.m.